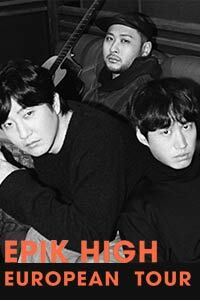 EPIK HIGH a 3-member hip-hop group lead by rapper, singer-songwriter and record producer Tablo. Debuted in 2001, EPIK HIGH is inarguably the pioneer in the Korean hip-pop scene. Their album 'EPILOGUE' took over iTunes and reached #1 on iTunes hip-hop/rap album chart. The group worked extensively with k-pop megastar BIG BANG and in 2014 EPIK HIGH and Taeyang of BIG BANG co-released chart topping single 'EYES, NOSE, LIPS'. With YG Entertainment, Tablo co-founded record label HIGHGROUND which housed artists such as Hyukoh, Code Kunst and many more. EPIK HIGH 2019 European Tour will be the group's first ever tour in Europe, these are the shows that you simply can't afford to miss! For the keyword: "EPIK HIGH"